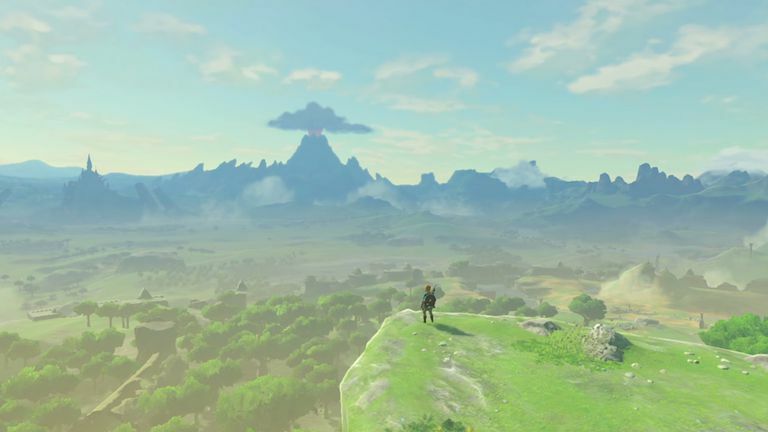 Before you set off to save Hyrule, you'd best bring along a list of Legend of Zelda: Breath of the Wild cheats if you plan on beating Ganon and getting the secret ending. These cheats are relevant to both the Wii U and Switch versions of the game unless otherwise noted. While climbing, press the B button to drop down, then immediately press B again while simultaneously holding the left analog-stick forward. Link will run for a second and then recover some stamina before he starts climbing again. You can repeat this trick as often as you want, and it even works in the rain. You can hold the whistle and press B repeatedly to sprint forward indefinitely without draining the stamina bar. This technique is a tad slower than regular sprinting, so switch between the two for maximum effect. Travel to a small island just west of Eventide Island. Use Magnesis to raise a chest containing 10 arrows from the pool of water. If you save your game and reload the save file, the chest will have respawned. Talk to a NPC named Cloyne in Lurelin Village to play a mini-game where you pay 100 rupees for a random chance to win 200 rupees. Save your game before you start playing, then save again every time you win. If you lose, just reload your last save file to get your rupees back. Northeast of Hebra Tower you'll find Pondo's Lodge where you can play a Snowball Bowling mini-game. You pay only 20 rupees for a chance to win 300 rupees. If your Master Sword is running low on energy, fast travel to Korok Forest and begin the Master Sword trials. You can immediately quit and leave Korok Forest with a fully recharged Master Sword. Drop a Spicy Pepper where you want to make an updraft and light it on fire using a torch or a fire weapon. Use this trick to reach high places. You can also create an updraft by lighting four or five pieces of wood piled together. To see the extended ending, you must find and unlock all 18 hidden memories and report to Impa before you defeat Ganon. Once accomplished, you'll see an extra scene after the end credits when you beat the game. Finding all of the memories requires you to acquire the Master Sword permanently and complete all four Divine Beast dungeons. You can find clues to the memory locations in photos taken by Zelda that are stored in your camera. Look south of the castle near a small pool of water surrounding a platform. Talk to Temba's wife after speaking to the village elder. Glide north from the Great Plateau Tower and look along the west bank for a small raised ridge. Talk to the Goron elder Bludo. Ancient Columns in Tabantha Climb a large ridge to the south of the bridge to find Tena Ko’sah Shrine and the memory in the nearby ruins. Return the Thunder Helm to Riju. Kara Kara Bazaar in Gerudo Desert Search around the nearby oasis. Eldin Canyonin in Eldin Climb to a peak west of Goronbi Lake and glide to a plateau with a ring of stones east of the Woodland Tower. Look around a big tree near the water northeast of the Ridgeland Tower. Zora's Domain in Lanayru Talk to Muzu after talking to the Zora King. West Necluda in Dueling Peaks Look for a tree with two small statues in front of it near the northeast side of the lake across the river from Scout’s Hill. Hyrule Castle in Central Hyrule Enter the castle from the west and head toward a tall spire north of the gatehouses. Carefully cross the walkway to find the memory in a collapsed room. Spring of Power in Akkala Find the spring nestled between the Akkala Highlands and Deep Akkala just south of North Akkala Valley. Sanidin Park Ruins in Hyrule Ridge Follow the road through Hyrule Ridge west of the Central Tower, and then take the path to the east of Satori Mountain to find it near a giant horse statue. Lanayru Road - East Gate in Necluda From the Great Fairy Fountain near Kakariko Village, follow the path to the right to find it near a large gate. Hyrule Field in Central Hyrule Search for a clearing in the forest on the eastern banks of Central Hyrule north of the Bottomless Swamp. Korok Forest in Great Hyrule Forest Locate the Master Sword and sacrifice 13 hearts to retrieve it. Fort Hateno in Dueling Peaks Find all of the other memories and talk to Impa. Then, visit the giant wall at nearby Fort Hateno and search around the pools of water in the center of a large battlefield. Nintendo has released dozens of amiibos that unlock secret items in BOTW. The only way to use these secret items in the game is to purchase the amiibo figurines; however, because the physical amiibos are difficult to find, many gamers are distributing codes online for unlocking amiibo content. Although such practices are illegal, you can easily find instructions for how to hack amiibos online in addition to lists of "Zelda: BOTW" amiibo items. By default, amiibos can only be scanned to redeem items once every 24 hours. However, if you move your Wii U or Switch console's clock a day forward, you can immediately scan the amiibo again. Exploit this trick to stock up on rare item. You can get Epona the horse only once the very first time you scan the Super Smash Bros. Link amiibo. Only summon Epona if you have a stable nearby so you can keep her permanently.